Although the fate of North School has consumed much of the oxygen in recent heated discussions, Measure S, the school facilities bond that will pay for rebuilding North, also funds planned construction at Hermosa View and Hermosa Valley, the district’s existing campuses. The district had planned to do the work at North first. Not only was it the most expensive project, but reopening a third campus would give it the flexibility to house students while work went on at the other two schools. North and Valley, under this arrangement, would serve as “swing schools” while work is done at View, and then North and View would take the load from Valley. But, in the event that the district faces an appeal of its approval of the North project that cannot be quickly resolved — or as now seems increasingly likely, a lawsuit from the City of Hermosa Beach — crowding could get far worse. 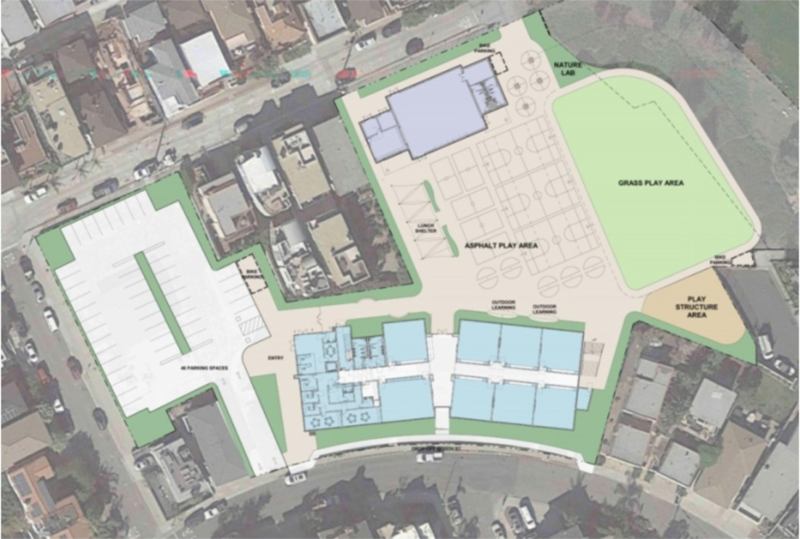 If prevented from proceeding on North, the district would use its bond money to start work on View, according to Doug Gardner, president of the board of education of the Hermosa Beach City School District. And although no plans have been made, this could result in putting every student in the already overcrowded district at Hermosa Valley School. “The board would need to evaluate pivoting to View as the first project if North gets delayed and consider the placement of portable classrooms at Valley to add View students and develop a plan to operate both school programs on the same site,” Superintendent Pat Escalante wrote in an email. There would be some irony in ending up, after the difficult battle over Measure S, back where the district found itself in the late ‘80s, when it closed or sold off five of what were once six campuses, and consolidated all grades, K-8, at Valley. Of course, when it did that, enrollment was just over 600; as of October of last year, it stood at 1,347 students. The possibility of cramming that many students onto Valley is one of many mind-reelers to have emerged in the controversy over North School. The school board approved the project at its meeting last month, but residents have raised concerns about the adequacy of planning efforts in advance of opening the school, which even proponents admit sits far from the city center and is accessed by narrow, winding streets, many of which lack sidewalks. Although sometimes castigated as NIMBYs, interviews with some of these residents reveal issues that are not easily brushed off, including the worry that, should an emergency occur during pick-up or drop-off time, first responders would be delayed in arriving. The impasse has forced the city to get involved. Along with a series of increasingly stern comment letters to the district, the City Council last Thursday held a hastily called closed-session meeting, the purpose of which was “initiation of litigation,” according to the agenda. (Another is scheduled for this Thursday, Feb. 7.) Only a few residents managed to get there for public comment, but their thoughts revealed just how divisive a potential lawsuit, in which attorneys for both sides would be paid for by the tax dollars of Hermosa residents, could be. “You’re going to be walking down the street with your kids and everybody is going to be pointing out, ‘Yeah those are the people that sued our kids.’ That’s what you’re basically doing,” Andrews said. Hermosa Beach residents Barbara and Ira Ellman didn’t vote for Measure Q, the Hermosa Beach City School District’s first attempt at financing the reopening of North, which in November of 2014 fell 32 votes short of the 55 percent margin needed to pass. They were among those who groaned about “the gym” and Measure J. But their children had attended Hermosa schools, and they were open to being persuaded. Less than a year after Measure Q, the Ellmans would be canvassing for school board member Monique Ehsan, who staked her campaign in part on a new bond effort, and in June 2016 they supported Measure S. More recently, however, they have raised questions about the board’s approval of the North project, and spoke out against it at last month’s meeting. While they would be disappointed if a lawsuit were filed, they feel it’s important to thoroughly assess the school’s impact. “I believe that there’s a good group of people, not all of them in that area, that are just saying, ‘This is too much. Let’s stop for a moment and get this right,’” Barbara said. The Ellmans are an example of how shifting political considerations have impacted North’s fate. The school board learned lessons from the failure of Q and applied them to S, including offering a far narrower range of potential expenditures, and moving the project away from Valley Park. But another, less obvious factor was arguably even more important to Measure S’ success: oil. Just five months after the failure of Measure Q, Hermosa voters went to the polls to overwhelmingly reject Measure O, which would have lifted the city’s ban on oil drilling in its tidelands. Measure O inspired huge turnout: an off-year, March election attracted voters in numbers similar to those that usually showed up during presidential contests, and voters rejected oil by a 4-1 margin. Shortly after the defeat of Measure O, a trio of Hermosa moms — Heather Baboolal, Christine Shultz and Christine Tasto — approached Mike Collins and Kevin Sousa, two of the leaders of the No on O campaign, about how to apply the techniques of the anti-oil effort to a potential school bond campaign. The result was the Hermosa Educational Renewal Organization, or HERO, which held dozens of “community coffees” and spurred involvement among residents who had sat out past school bond measures. Oil ushered in a new political alignment in Hermosa. The first general election after the Measure O vote, in November 2015, returned former Councilmember Jeff Duclos, and brought on first-timer Justin Massey, who was active in the anti-oil campaign. Five months later, Stacey Armato, who partnered with Collins and Sousa to lead the No on O campaign, began her first term when she replaced Councilmember Nanette Barragán, who left to run for Congress. Opposition to oil was broad enough to include many who would go on to fiercely oppose Measure S, and previous councils had also backed school bonds, including Measure Q. But the new council was notably sympathetic to district causes. Along with endorsing Measure S, the council participated in a joint meeting, the week before the June 2016 election, at which an attorney and consultants for the district addressed some of the most persistent challenges to the bond. The victory of Measure S did little to diminish this furor. Shortly after the results of Measure S were announced, resident Parker Herriott sought to have criminal charges brought against the members of the school board; the District Attorney’s office received the complaint, but no action was ever taken. This effort crescendoed in the complaint filed by Smith, a sprawling legal salvo that featured earthquakes, famed architects, and 445 pages of attached exhibits. Right or wrong, the emotional intensity of this opposition has almost certainly made it easier to dismiss. (As historian Richard Hofstadter wrote, “the paranoid style has a greater affinity for bad causes than good.”) Several people interviewed for this story with concerns about traffic around North School took pains to distinguish themselves from those who opposed Measure S.
But the difference is not always easily understood. Jim Fasola, an architect and Hermosa resident, has spoken at several meetings about North, including the one at which the project was approved. It is likely that Fasola’s support of North’s architectural significance, a key issue in Smith’s suit, caused backers to lump him in with Measure S opponents. North, in other words, masked disagreements among its supporters before it papered over differences in its opponents. And the brief Era of Good Feelings in Hermosa politics that followed oil’s defeat has given way to painful disagreements and second-guessing among people who had only recently worked together. The point mystifies the district’s allies as much as it piques its critics. According to a list of meetings provided by Escalante, Escalante and Lowenthal met three times between the city’s September letter and the board’s vote on the project. Two school board members and two city council members also met for a city-school compact meeting in October. In interviews, some district parents following the approval process speculated that the disconnect is rooted in turnover among city staff. Since the city issued its first letter on North, in January of last year, Hermosa has had three city managers. And, with last month’s sudden announcement that Public Works Director Glen Kau was no longer working for the city, there have been at least three different heads of the department responsible for potentially implementing the traffic mitigation measures called for in the EIR. Councilmember Massey, reached over the weekend following the council’s closed session meeting last week, disagreed that changes among city staff had impacted the city’s approach to North. He pointed out that staff in the City Attorney’s office had remained consistent. Although it may have been feasible to ignore political opposition to Measure S, it has been harder to do so with legal issues. Smith’s suit was dismissed, but defending it cost the district money, and the prospect of another one haunted the school board as it worked on the EIR. “The constant threat of litigation from a certain group of citizens has created this environment where communication and involvement has been less than ideal on both sides,” Baboolal told the council last week. For example, some of the traffic mitigation measures suggested in the document, such as restricting parking on 26th Street to allow for the flow of two-way traffic, would require city approval. The city’s response has been that more information is needed to evaluate whether it would agree. But one school board member said that part of the reason the district had not submitted formal applications in advance is that the district feared a “predetermination” lawsuit. Such a claim — that a public entity has made up its mind about a project before the environmental review process had been completed — would surely be bolstered by the existence of a detailed scheme for dealing with impacts generated by a particular version of a project. Massey, while declining to comment on the substance of closed-session discussions, said he was sympathetic to the point about predetermination, and that it would be one of several that the council would potentially have to discuss with the City Attorney. “There are lots of people on both sides who want to avoid litigation,” Massey said. The EIR the district conducted for the project ultimately concluded that there would indeed be “significant and unavoidable” congestion impacts in the area surrounding North. But the California Environmental Quality Act enables public entities, including city councils and school boards, to approve a project despite such impacts, if they feel the project’s benefits would outweigh them. Understandably, the legal explanation — We’re within our rights to do something that may prove unpleasant for you! — has not been the rallying cry for North backers. For one thing, this power may not apply if the analysis, such as just how bad congestion will actually be, is challenged. But it gets at the fundamental issue on which debate over North turns, one that is difficult to separate from Measure S, Measure J, and the rest of recent history: How much deference is owed to a public school? Paul Hinkle lives near North and has followed the debate over its approval. “I always felt like they were pointing at each other. Citizens don’t care who does it. What we want is for both parties to work together to deliver a well thought-out plan that is executable,” Hinkle said. He also thought that, regardless of the steps that the city and district agreed to, some uncertainty is inevitable in opening a school. Note: Quotations from the interview Paul Hinkle have been updated to reflect the corrected transcription of his comments.